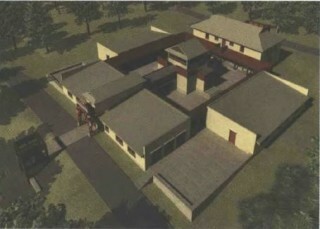 Architectural rendering of the future Kalachakra center. Image by Allen McLane Chambliss, Jr.
As Tibetan Buddhism develops in the West, the need for authentic teaching and practice centers which can nurture the tradition grows increasingly important. Contributor Ted Arnold of the Namgyal Monastery Institute for Buddhist Studies in Ithaca, New York, writes of a new home for Kalachakra practice in the U.S.
Due to the great kindness of His Holiness the Dalai Lama, many thousands of practitioners have been initiated into the Kalachakra tantric system. However, there has been an obvious problem: how to maintain and deepen one’s practice after the initiation? Even with the tireless activities of the late Kirti Tsenshab Rinpoche and other kind teachers, there has been no single location where Kalachakra practice can develop and flourish – but this is about to change. His Holiness’ personal monastery, Namgyal Monastery, is well-known as the storehouse of the Kalachakra teachings and rituals, and so it is fitting that its North American branch – Namgyal Monastery Institute of Buddhist Studies – is building The Land of Kalachakra Study and Practice, Du Khor Choe Ling. Kalachakra is well known as a vehicle for world peace, with its association with the glorious kingdom of Shambhala and its correlation between environmental and individual ‘wheels’ of experience, which are perfected through Kalachakra practice. The teaching was given by the Buddha at Amaravati at the request of the king of Shambhala, and there it was disseminated widely. It was only in the 10th century that the teachings finally returned to India and were transmitted soon after to Tibet, where they became regarded as the pinnacle of Buddhism. Now the precious opportunity for these teachings to become fully transplanted in the West has arrived.